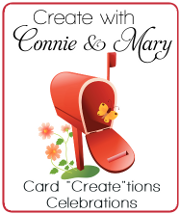 WOW…it’s hard to believe but we have come to the end of Create with Connie and Mary Card “Create”tions Celebrations! The design team put together AMAZING card sets for our subscribers! And since it is Saturday the team is going to once again share a favor using the same set they used for their card set. 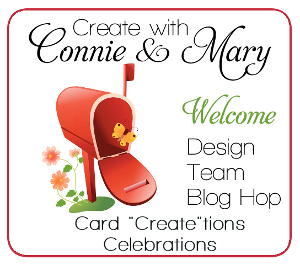 If you are going forward through the hop you arrived here from the Create with Connie and Mary site. Now is a GREAT time to subscribe and get ideas for card classes to take you through the end of this catalog! I have to say, I did struggle a bit coming up with a favor for this week. But, since the ONLY stamp from this set that I did not use on my card set was the chocolate saying, I decided to go with that. 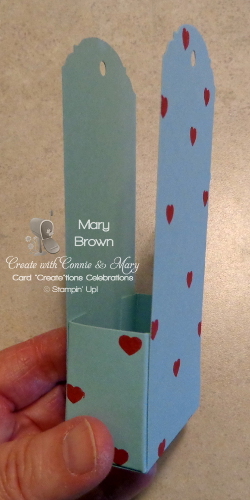 How cute this is and so easy to make! I decided to give you a quick little tutorial in case you wanted to make one too! Cut another strip 5 x 1 7/8. 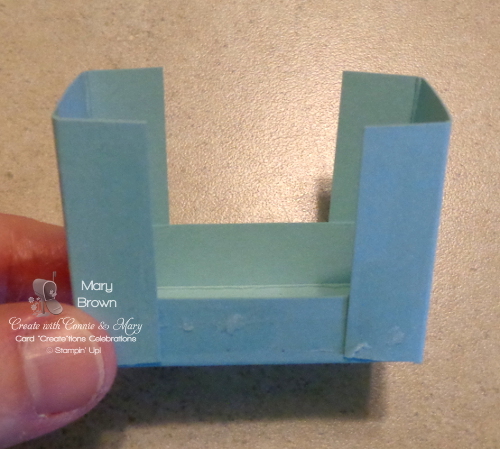 Score along the 5″ side at 1 1/2 and 4 and along the 1 7/8 side 1/2″ along each side. Use the Ornate Tag Topper punch on BOTH ends of the 11″ piece. Trim the 1 7/8 x 5 piece as shown in the picture. NOTE: before putting together, if you want to stamp on it, do that first. Put the 1 7/8 x 5 piece together as shown in the picture. Add to inside of 2 x 11 piece as shown in picture. When done you have a handy little favor. That PERFECTLY fits 3 Ghirardelli Chocolates. 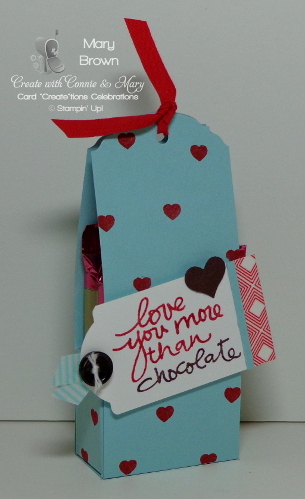 To decorate mine I cute a piece of Whisper White 1/2 x 3, stamped the greeting using Real Red and Chocolate Chip markers. Use the Note Tag Punch to punch the left side. Fold piece of the Beach House Washi and add to back of tag, then tie Whisper White Baker’s Twine in Chocolate Medium Button and add to tag. 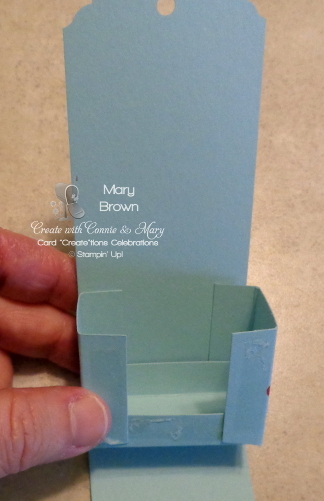 Add Beach House Washi on right side and then add Pool Party 1/8 x 1 1/2 cardstock. Add tag to box using dimensionals. Tie closed with Real Red 1/4″ Cotton Ribbon. featuring stamp sets in the Annual, Occasions and Online Catalogs…we have just finished up this collection and it’s still a GREAT time to join! 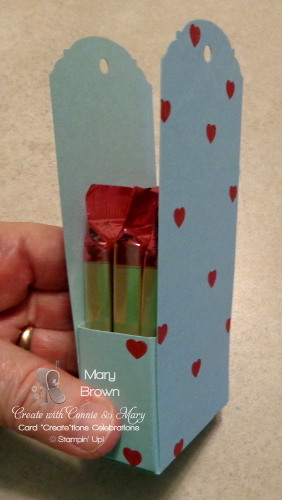 This entry was posted in 3D, Create with Connie and Mary and tagged Lovely Amazing You. Bookmark the permalink. Thanks, Mary for this great idea. Cannot wait to CASE this.